As you may have heard on our recent episode of Let's Talk TJ's, it's probably a good thing Nathan got to the review of the Popcorn In A Pickle first. It's not that I didn't like it...it's just that I wasn't anywhere close to as enthused as Nathan, Sonia, and apparently everyone else on this planet of ours. I feel like if I had written the review and said anything even slightly negative, it would've gotten a tremendous backlash, and well, we try to keep it friendly here folks. We really try to be an oasis away from all the other noise out there and to just be positive. The world doesn't need much if any more angst, acrimony, or snark...okay, guilty of the last one occasionally...but we want to be a lighthearted diversion. 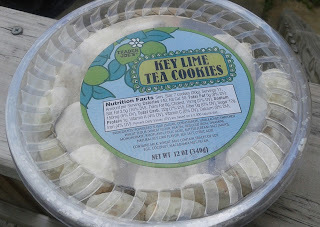 For a similar reason, good thing I'm writing this review on Trader Joe's Key Lime Tea Cookies. The Rodgers weren't terribly sold on them - too strong flavor, too much powdered sugar, etc etc. Me? Listen: I've spent the past year or so finally cultivating some sense of self control for the first time in my adult life. I threw it completely out the window when it came to these cookies. Not gonna lie: I basically ate the whole package myself. Over several days, yes, but man, what a glorious run these were. Every cookie seemed better than the previous - the crumbly texture of the cookie middle, the quickly intensifying lime flavor in all it's soursweet citrusy glory, all of the sugar adding a sweet balance. Oh goodness. Make no mistake: these key lime cookies pack a wallop that honestly I didn't expect. Biting one in half to take a look at the cross-section reveals a little magic while adding to the mystery - the cookies is composed of basically 90% cookie bases, with a thin (maybe half to a full millimeter) sugar coating similar in appearance and feel to a Muddy Buddy (except a little bit more) with a confectioner sugar dusting. It's in that thin sugar coating that all that key lime flavor is contained. How? I don't know. All I know is I would eat and eat these until my lips and mouth began to hurt, like I had too many Sour Patch Kids or salt and vinegar chips - maybe it's just me, but I love that sensation. Amazing cookies, in my opinion. As for Sandy? Well, I think she may have gotten a couple of them, if any. I asked for her take, and about all she said was "I bet they tasted good." What I do know is she really liked TJ's key lime pie (which these were very similar in taste to sans gingery crust) so if given a fair chance to adequately assess these cookies, I can't imagine her going lower than her score on that. For me? Just two small quibbles: There is a lot of sugar dusted on top, perhaps a little too much here and there - I coughed out a dust cloud or two, but that may have been more my excess than potential cookie foul. Also (and Sandy and I share this) - no idea what kind of tea to have with them. These are too potent to pair up with many teas - have a suggestion? Share it! Regardless, I'm going near-perfect here. It took me awhile to get these, then noticed my daughter had these at her apt. and they were half gone.. so bought some and will try these after reading your review. I remember Trader Joe's had these years ago, probably back in the 90s and I loved them. I can't possibly buy them now, knowing that ... I will eat the whole tub. I could save the powered sugar and use it for other desserts. Since it might have some tang in the sugar. These are great. I had them at a friend's house. she actually took a napkin and wiped off a lot of the powdered sugar. And then she put key lime curd between two cookies to make cookie sandwiches! So good! I loved these too! They are definitely not for the casual key lime fan, but I liked the intensity. I couldn't eat more than a few in one sitting, though (maybe that's not a bad thing....). These are delicious, and you don't need a lot to get your fill =) Love. If it took you several days to finish the container, you should count that as a victory. Shows excellent control. Mine were weirdly salty - the last taste I got with every cookie was salt. I pawned them off on my parents who were in town visiting for a weekend. The package I purchased were salty as well. No one in my house could stand the salty taste. I ended up pitching them. I love some good key lime, and these hit the spot. Not too much sugar IMO--it just balances some of the tartness. And they are on the small side, so I just eat 1 oe 2 to get my fix--and the tub will last for quite a while. For me, this isn't the type of cookie/treat that encourages gorging until they're gone. And that's a good thing. Small, intense flavor bites!